Saint-Sauveur Cathedral of Aix-en-Provence is an ancient structure of many secrets -a perfect monument to fill the lens of a celebrated photographer, and a perfect place for the photographer's son, Ned Marriner, to lose himself while his father works. Fast paced story which held me bound to listen and complete in just two days. "Ysabel" is a fun and unique story centered around a 15 yr old boy in modern France. The story is fit for a broad spectrum of readers. From teens to grand parents. Myself being in my mid 50s found this book because I love the narration of Kate Reading who I first listen to reading "Eye of the World" by Robert Jordan(I also highly recommend). Her narration of "Ysable" is superb. I had doubts when the story started: the hero is 15 and talks like a stoner dude <lol>. But I remembered reading books by this author (a long time ago) ....and enjoying them. So, I hung in there. Excellent read. I really enjoyed the story (and it's been a while since I could say that without qualifying the statement <g>). A good story, well read. If you liked Sepulchre and Labyrinth by Kate Mosse, you'll like Ysabel. I liked this book very much. It's similar to Sepulchre and Labyrinth - a tangling of characters from different times (although from a much earlier period). Set in the same region - Provence. Narrative is well written and moves along, and the descriptions of the earlier history is very interesting. Characters are well defined. Kate Reading does a good job of portraying all the voices -- even the men. Kay has such a talent for creating an astonishing blend of character, setting and plot. Sure, the book could be taken as an extended tourist pamphlet for southern France, but the setting is so essential that it doesn't come off forced. I love the characters that Kay creates, because they are such true people, none of them really truly good or truly bad, everyone is just trying the best to get what they want. Each character has their own motivation and is good or evil in relation to that. Also, unlike most books, it was nice to see that when some insane problem faces the fifteen year old main character he doesn't go out and solve a thousand year old problem, he goes to his parents for help, like an actual person not a book character would. Two things to keep in mind. Characters from Kay's Fionavar Tapestry books are in this book. Now, you don't need to have read the Tapestry trilogy since the plots aren't really connected, but it might help you understand some of the characters more. Second, while I hate to criticize Kay's work, Edward Mariner has two male assistants, yet Greg is the only one who really plays any part in it, and I'm not sure why the other one is in the book at all. It sort of seems like he was written in as an afterthought, and I'm not even sure why. I'm pretty sure he's even referred to by the wrong name at one point. A minor thing, but it just stuck with me as I was listening. The narrator did a great job, I thought, of capturing both a teenager's sarcastic inner dialogue and the beauty and scope of the tale and its setting. What made the experience of listening to Ysabel the most enjoyable? Kate Reading's reading was excellent as always. Kay's writing was full of the beauty and emotion that as a frequent reader I have come to expect. 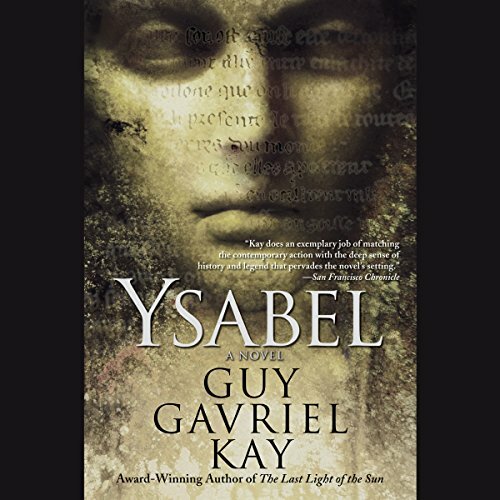 What other book might you compare Ysabel to and why? 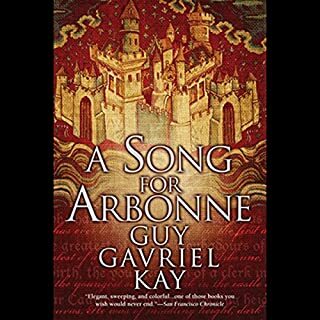 Ysabel is similar in style and tone to all of the other Kays books that I've read - Tigana, Song for Arbonne, Lions of Al Rassan - but also very different. It isn't as historical in flavor. The elements are there, but the setting is modern-day with talk of iPods and the Internet. Also, the main characters are teen-agers, so it has something of a young-adult feel to it. I think I enjoyed the final wrap up the most. Normally, I am disappointed at the end of a book, but I think the destination made the journey worthwhile in Ysabel. It often takes me a bit to get fully engaged in a new Kay novel. Ysabel, however, was probably the hardest for me to get in to. I think that since the setting and main character ran counter to my more traditional fantasy expectations, I had reservations on how much I would like the book. Also, the action is sparse. I am glad, though, that I stuck with it. The second half of the book was beautiful and worth the extra effort. 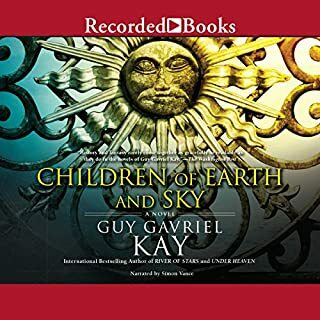 Every book written by Guy Gavriel Kay is a masterpiece! I nearly gave up on this book. All the male characters sounded alike and they all sounded like delirious surfer dudes. The narration of female characters was better, but not strong, and all the lovely descriptive passages were just not well conveyed at all. The only positive I have to report is that I'm planning to buy and read the actual book to get the taste of the narration out of my brain. After graduating from law school, this author was hired by Christopher Tolkien, J.R.R. Tolkien's son and literary executor, to collate tolkien's notes, write an outline outline, complete multiple drafts, and finish, the Silmarillion. 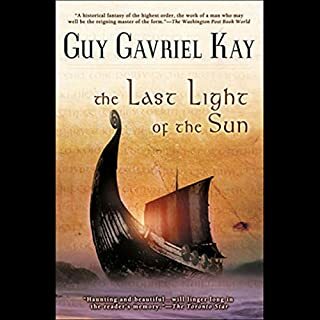 Guy Gavriel Kay is the best author, in any genre that I have ever read. I have been reading excellent fiction, including fantasy, for 50 years. His first three books, which are a trilogy, are very and purposely derivative of Tolkien's work. 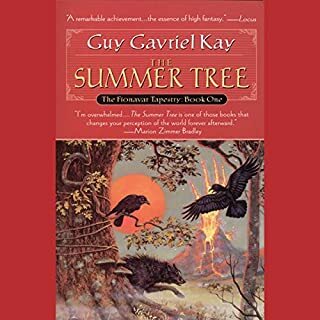 Each subsequent book in Kay's bibliography, and there are about 10 of them, are set in alternate world, all with two moons. The stories are set in a specific Time and place in Earth's history so you end up learning quite a bit about the history of the world while reading fantastic fiction. The characters are richly described, and,not always standard sword and sorcery genre characters but are fully developed in every case. Each new novel has less and less supernatural, i.e. magical, events in them but this does not detract from his gorgeous writing style. I would highly recommend this author, for all fans of excellent fiction, even readers who do not necessarily enjoy fantasy. The bonus is, each book is narrated by Simon Vance, who, in my opinion, is the best narrator on the planet. If you could sum up Ysabel in three words, what would they be? Great story, great author. Kate Reading was good, though sometimes her teenage characters came across as petulant. 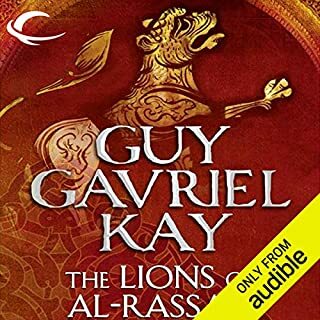 Would you try another book from Guy Gavriel Kay and/or Kate Reading? 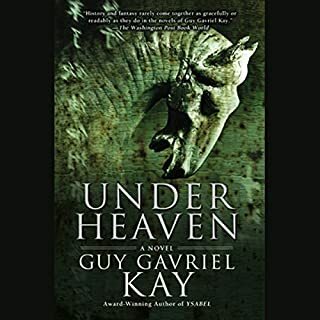 GGK is one of my favorite authors and Kate Reading is one of my favorite narrators. That a collaboration between the two could be this awful a trash fire was a big surprise. But yes, I would still give either one another chance. Would you be willing to try another one of Kate Reading’s performances? Yes, Kate Reading is a far better voice actor than this book would indicate. It’s not her fault the book was so bad. Disgust: at the shallowness of the characters, of the overused tropes of male wunderkind and whimperingly frightened / overly sexualized female sidekick. That Kate was smart could have been neat, but it was just treated as her being annoyingly nerdy. Disappointment that Kay, who usually has very interesting writing, could have written something so awful and plodding. Sadness that Kate Reading, who is a brilliant voice actress, had such drivel to work with. Even so, to be honest it was the worst KR performance I’ve heard. I kept on trying to listen and get into this book, but I just can’t listen to it anymore. The writing is awful and the blind sexism is raising my blood pressure. Such a difficult book to review. Unlike Kay's other work, this is a fey novel. Kay is a master of his art and this book is no exception. The plot races, unfolding surely in his hands. His characters are precisely, lovingly portrayed with his signature realism. These are real people dealing with unreal situations and events. Quick synopsis: a young teenager is transplanted from Montreal to Aix en Provence when he accompanies his photographer father and his team on a photo shoot. He is dragged into an old, old story of betrayal and love that spans millennia, wrecks lives and even cultures. He struggles to understand his place in the tale while racing against time to save a friend. The descriptions of Provence are truly beautiful. Such an inspiring place, drenched in sunshine and blood alike. Kate Reading is... There aren't enough words to describe her skill. The tone of her voice is soothing, exciting, enticing - a real pleasure to listen to. She handles a 15 year old boy and a millennia old man with ease - not a small feat. She can make even the most turgid story fantastic. I have listened, re-listened and listened again. I'm in love with the story and the narration. Wonderful descriptions of Province and the land marks which make me want to visit...but probably never will. I enjoyed the story line that we may have other histories and other reasons we do what we do. I am a counsellor and often work with people who want to know definite reasons and answers to why they react as they do, these type of story lines help me think that life is/can be so much more complicated than that. I was initially disappointed to hear the American accent narrating, but she does the voices very well, high pitch and low, subtley changing as the characters developed. I liked the sexual/ flirty conversation which made me grin amd warm inside. I enjoyed believing we are capable of so much more than we think! I did get bored at some of the journeys and drama but it did not ruin the overall enjoyment.